"It’s a long way away, but it is there." Saxby Pridmore on Kepler 452b. The possibility for life on other planets is something that has captivated our society since we first began exploring the space that exists beyond our earth. Technology is currently limited to only viewing these planets existing outside our solar system, however, it is plausible that with technology continually advancing, in the future these planets may not seem so far out of reach. In 2015, the earth-like exoplanet Kepler 452b was discovered by the NASA Kepler telescope.1 This discovery prompted an inquisition into the possibility for this planet to sustain life. Though this concept cannot currently be accepted or denied, this research will explore the parameters necessary for life on exoplanets, and which of these may be possible for Kepler 452b. From the time of the first exoplanet discovery, the list of existing planets orbiting stars other than the sun in our own solar system has expanded to include thousands. These planets may hold valuable information, resources, technology, as well as invite the possibility of communication with other forms of life. It is important that research conducted on planets like Kepler 452b be carried out so that we may better understand the possibilities of life beyond Earth. Earth is used as a benchmark for determining whether or not another planet may be habitable because so far, it is the only planet that we know can support life. The habitable zone is commonly referred to as a region in which a planet of rocky terrain can maintain liquid water on its surface.2 Earth is in the habitable zone of our solar system and capable of sustaining life, and there are many factors that influence this. Earth is situated at a proper distance from its star, it is protected from solar radiation by a magnetic field, kept warm by an insulating atmosphere, and contains the correct chemical ingredients for life including water and carbon. Additionally, elements are cycled through the planet by the biogeochemical cycle, which helps sustain life by forming mineral and energy resources.3 Another way that a planet can recycle resources required for the sustenance of life such as carbon dioxide, water, and oxygen is by a tectonic system. A tectonic system continuously produces and destroys the crust of a planet. Our tectonic system on Earth functions by subducting materials down into its interior, then volcanoes re-erupt them into the atmosphere. A habitable planet must also have an average temperature between 0 and 100 degrees Celsius, and must be able to maintain this temperature.4 Carbon dioxide is the main greenhouse gas with a long-term effect for maintaining a stable climate.4 If the amount of carbon dioxide increases, the temperature will also increase. Therefore, the amount of carbon dioxide must be controlled.4 These important molecular abundances are determined by photometry and spectroscopy of the exoplanet's atmosphere. Such observations are combined with models and simulations to make predictions on the atmospheric composition of Kepler 452b. As seen in Figure 2, Kepler 452b has many similarities to Earth. Figure 2. This graph demonstrates the close relationship of Earth and Kepler 452b in respect to their location within the habitable zones of their respective stars. The light green band represents a conservative estimate of the habitable zone, and the dark green band represents an optimistic estimate of the habitable zone. Credit: NASA,N. Batalha, W. Stenzel. https://www.nasa.gov/sites/default/files/thumbnails/image/fig6-surfacetemperaturevsenergy.gif. 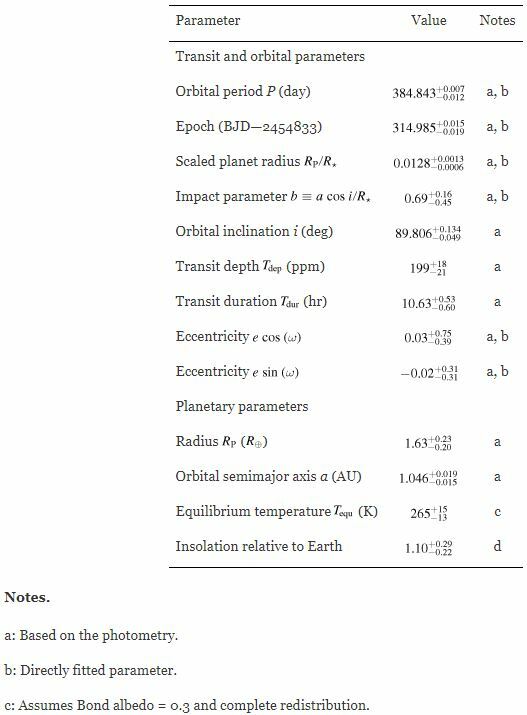 The following table outlines some of the key physical properties of Kepler 452b. Table 1 Physical properties of Kepler 452b1. 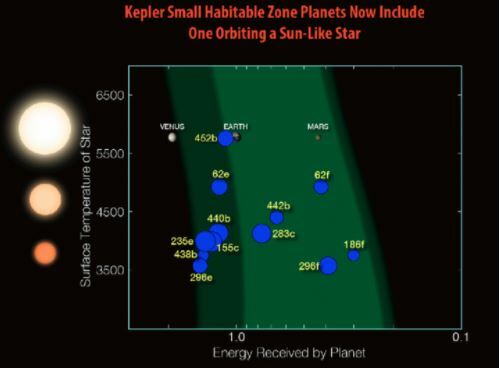 Figure 3 visually displays Kepler 452b's and Earths's similar radius size. There are many ways in which researchers are investigating the possibility for life on Kepler 452b, including assessments of likely terrain, atmospheric composition, and climate. 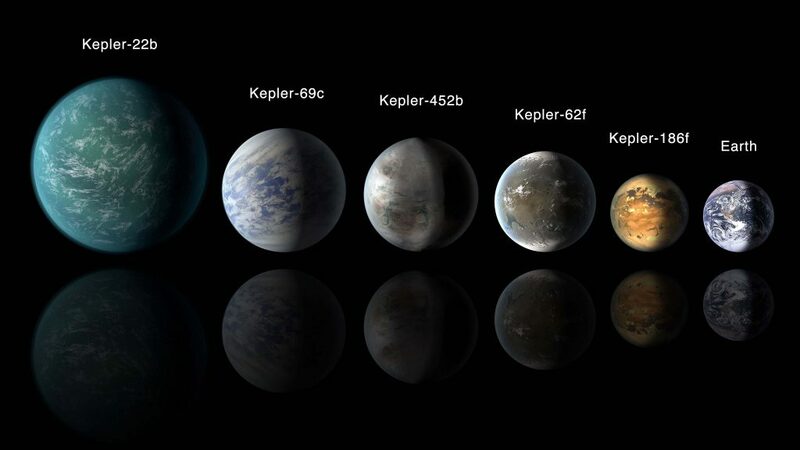 It is speculated that Kepler 452b likely consists of rocky terrain, and is situated within the habitable zone of the G2 star that it orbits.1 The criteria outlined by a habitable zone definition would provide a basis for the existence of carbon-based, photosynthetic life.5 It is estimated that if these such life forms exist and are numerous enough to affect the atmosphere of the exoplanet, the “biosignature gases” produced could be detected through highly specialized microscopes and be directly indicative of life.6 In addition, General Circulation Models (GCM) have been used to simulate potential atmospheric compositions of Kepler 452b. These models suggest that Kepler 452b could be habitable if the atmospheric conditions consist of a CO2 concentration equal to or lower than that on Earth.7 In addition to atmospheric composition, there are other factors that can influence climate and habitability that are not all accounted for in these models, including planet surface gravity, total surface pressure, ocean coverage, orbital eccentricity, rotation period, and axis inclination.8 These can be assessed using the Earth-Like Planet Surface Temperature model (ESTM), a model developed to evaluate the surface temperature of Earth-like exoplanets.9 It is suggested that Kepler 452b has been in the habitable zone for ~6 billion years and will remain there for another ~3 billion years. This time spent in the habitable zone would allow for ample opportunity for the development of life as Earth has only been in the habitable zone of the Sun for ~4.5 billion years.1 Though our current day research is unable to confirm or deny the presence of life on Kepler 452b, the continued development of these models will be key in answering that vital question. Just because a planet is situated in the habitable zone of its solar system, does not necessarily mean that it is habitable. For example, Mars is situated in the habitable zone in our own Solar System but has no magnetic field to protect it from the solar wind. In order to have a magnetic field, a planet must exhibit the dynamo effect. The dynamo effect relies on a rotating, convecting, and electrically conducting fluid to maintain a magnetic field over astronomical timescales.12 Without this protection, the solar wind can strip a planet of its atmosphere and cause it to be inhabitable. 10 Mars is in the habitable zone but has lost the majority of its atmosphere, so water does not flow on its surface. The planet is not able to trap enough heat because of its thin atmosphere. Therefore, it is too cold to be habitable.12 Currently, Kepler 452b is too far out of our reach to be able to send a spacecraft with a magnetometer to measure the magnetic field, if it has one.13 There are many complex contributing factors to a planet’s habitability, therefore coming to any conclusions based strictly on limited data and inferences can be difficult. A complete assessment of the habitability of an Exoplanet would require very detailed information of all properties, and obtaining that information is beyond the reach of current technology.11 Additionally, even in the event that Kepler 452b satisfied all parameters deemed necessary for it to be classified as habitable, that does not necessarily mean that it is inhabited. Our current understanding of Kepler 452b yields promising results in respect to habitability potential, however, continued research in this area is required. With the continued development of new technology, every day as a society we are getting closer to answering these intriguing questions and potentially discovering other forms of life that may exist beyond our solar system. Though there are still many secrets left to uncover on Kepler 452b, it is within the realm of possibility that this planet may someday be referred to as a Second Earth. 7 Y. Hu et al. ApJ. 835, 1. (2017).